Earlier in the season, when Tony was out on the lake with Bobby, he asked what the end would be like. Bobby said something to the effect of probably everything would go black and you probably wouldn't even hear it coming. Tony had a flashback of that conversation before going to bed in the second to last episode of the series. In the end, he didn't hear the shot coming, but he died with his family just as Phil died with his. Then everything went black, just as Bobby predicted. Hmmm...or maybe they decided on another season? Did he die, or was it ambiguous? Bobby saw his death coming. Tony is not dead. It's just David Chase give one last "FU, I'm smarter than you" to us meager simpletons. I never watched the Sopranos, but my take is that what Chase did was sheer brilliance, 20 years from now people will still be discussing and arguing about what happened. It’s been over for 90 mins out here. I don’t think it was ambiguous, it just takes a little time to see. That was the reason for the flashback in the previous episode. David Chase just didn’t want to spell it all out for everyone. Bobby specifically said everything would just go black. The only way I think it could be ambiguous is if there were other similar pointed allusions to the end that I may have missed that were intended to introduce ambiguity. Otherwise I think Bobby’s words were right and the series ended at the same instant as the life of its main character. I think more people will realize it as the watch old episodes again and see the bigger picture fitting together. 2 seconds from now, you have thousands of people cancelling their HBO. I think the ending is left to the viewer. Your theory is retarded but you did succeed in making me think about something. The series ended in a black screen. Maybe Bobby was right and you are onto something. For the wrong reasons. Or maybe we are all reading way too much into a TV show. I forgot about the Left Coast, but I didn't really spoil anything. If it makes you feel any better, a lot of people who saw the episode disagree with me. This thread is already proving my point. 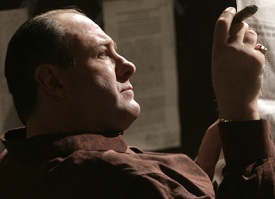 All anyone can say is that on the last scene of the Sopranos Tony Soprano was still alive. Its been over for 90 mins out here. That's if one gets the HBO east feed.. I do, but I want to watch it in hi-def. I know that if it's that important for me not to know in advance what is going to happen on a television program, living on the west coast, I should stay off the 'net, turn off my tv and sit in my closet until the program airs in my time zone. I learned my lesson on the FR thread about 24 titled Edgar Dies! posted 2 hours before it's airing out here. Exactly, I’m in the West coast, but thankfully I don’t watch sopranos, or I’d be pissed at that headline giving away the story line. I sure wish people who put out stories and give away the surprise in their subject line (i.e. such as who won American Idol, or who won DWTS, or how a show ended, etc.) would remember that those of us in the West coast are 3 hours behind and there are those of us who do like to be surprised. Well if you’re in California think of it as your punishment for having Feinstein and Boxer as your senators. If you’re in New Mexico, Richardson for your governor, etc. I learned my lesson with the olympics a few years ago when it was about the women’s ice skating and the U.S. girl came from behind to win it. So on American Idol finals and DWTS finals, I now stay away from the computer once the show ends up back east. I also stay away from all “24” threads since we are not caught up watching all the seasons. However, sometimes if it’s posted on the subject line, it does no good to even stay away from the threads. Well if youre in California think of it as your punishment for having Feinstein and Boxer as your senators. As if having those two, in and of itself, isn't punishment enough. What are you, a sadist? Left coast liberals like you wouldn't like the episode. It's rated R for Smoking. There are some nice reruns of "Will and Grace" on for you to watch.